Procedures up to international boarding are shown below. At Ibaraki Airport, all the procedures can be completed on the 1st floor and boarding is very smooth without the need for moving floors. Please come to the International Flight Check-In Counter and check in early. Please receive your boarding pass and baggage receipt from airline staff. * If you are participating in packaged tours of travel agencies, please follow the guidance of your travel agency. We conduct carry-on luggage / security inspections at the security check counter. Please present your boarding pass to the security personnel, and place your carry-on luggage through the X-ray scanner. Passengers themselves go through a metal detection gate for security inspection. Passengers who bring foreign-manufactured items or a large amount of currency out of Japan may be required to follow customs procedures. Please visit the Japan Customs website for details. At the passport control booth, please present your passport and boarding pass to the immigration officer. ※Please take off passport covers in order to maintain smooth inspection. Please get on board following the guidance of airline staff. At Ibaraki Airport, passengers board the airplane with an accommodation ladder without using a boarding bridge. When you are out of the boarding gate, proceed along the path and go up the accommodation ladder to board the plane. At Ibaraki Airport, passengers leave the airplane with an accommodation ladder without using a boarding bridge and then proceed to the passenger terminal building. When you have gone down the ladder, proceed along the path and go to the arrival gate. If you have received a quarantine questionnaire while on board the aircraft, please fill in the necessary information and submit the questionnaire at the Quarantine Counter on arrival. Please inform the Quarantine Counter if you suffer any symptoms such as fever or diarrhea. Please proceed to the relevant booth indicating “Japanese” or “Non-Japanese” and present your passport. If you have checked in your luggage, go to the baggage claim and check your baggage claim receipts to retrieve your baggage. 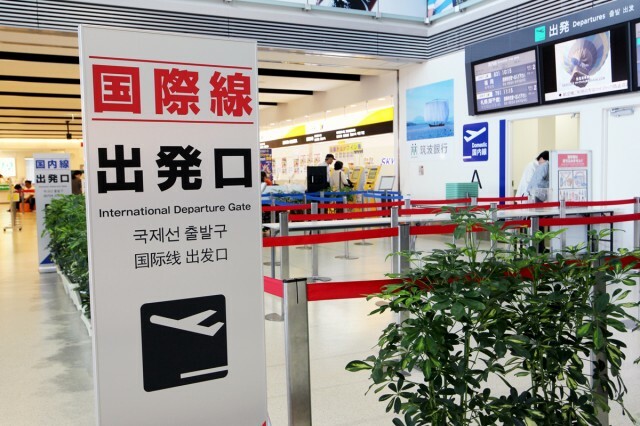 Passengers bringing animals (including meat products) or plants (including fruits and vegetables) into Japan must have them inspected at the Plant and Animal Quarantine Counter. Items brought into Japan from overseas must be declared on arrival. Passengers who have not exceeded the duty-free allowance and have nothing to declare should go to the counter with a green lamp. All other passengers, or passengers who are unsure should go to the counter with a red lamp. All passengers are required to submit a declaration form to customs for accompanied and unaccompanied items. Please fill in the form in advance. This is the end of all procedures. Thank you for your cooperation.